Huangshan (literal meaning Yellow Mountain) is a mountain range in southern Anhui province in eastern China. The area is well known for its scenery, sunsets, peculiarly-shaped granite peaks and pine trees. Huangshan is a frequent subject of traditional Chinese paintings and literature. There are more than 30 touring paths in total in Huangshan mountains, which are 50 km (31mi) in total length and 1-2 meters (3-6ft) wide generally. 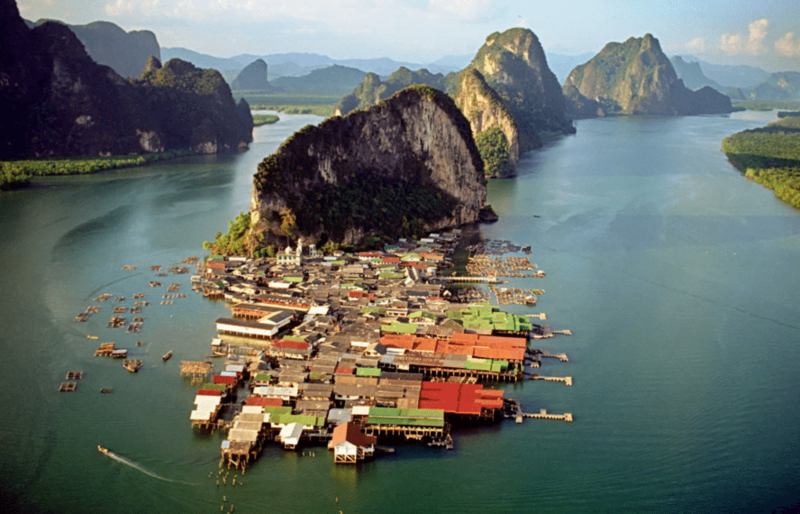 Ko Panyi is a fishing village under the shadow of an immense limestone cliff in Thailand, notable for being built on stilts by Indonesian fishermen. At the end of the 18th century the law limited land ownership solely to people of Thai national origins, and due to this fact the settlement was, for the most part, built on stilts within the protection of the island’s bay, providing easy access for fishers. With the increase of wealth for the community, due to the growing tourism industry within Thailand, purchase of land on the island itself became a possibility, and the first structures of relevance were built, a mosque and a freshwater well. The Scala dei Turchi (Italian: “Stair of the Turks”) is a rocky cliff coast in southern Sicily, Italy. The Scala is formed by marl, a sedimentary rock with a characteristic white color. It lies between two sandy beaches, and is accessed through a limestone rock formation in the shape of a staircase, hence the name. The latter part of the name derives from the frequent raids carried on by Moors. Fjaðrárgljúfur is a canyon in south east Iceland about 100 m deep and about 2 kilometres long, with the Fjaðrá river flowing through it. The canyon has steep walls and winding water. It is located near the Ring Road, not far from the village of Kirkjubæjarklaustur. The canyon was created by progressive erosion by flowing water from glaciers through the rocks and palagonite over millennia. A waterfall flows down the western side of the canyon, visible from an observation platform at the end of a one-mile hike up the eastern edge. The Terme di Saturnia are a group of springs located a few kilometers from the village of Saturnia in Italy. The springs that feed the baths, which are found in the south-eastern valley, cover a vast territory that stretches from Mount Amiata and the hills of Fiora and Albegna rivers. One legend, according to the Romans, was that the springs were formed by lightning bolts, thrown by Jupiter. The earth split apart to form hot springs that flowed in warm waterfalls. The sulfurous hot springs, at a temperature of 37.5 °C, are well known for their therapeutic properties, offering relaxation and well being through immersion. The main thermal waterfalls are the Mill Falls – located at an old mill – a series of rock pools that have been turned white by the minerals in the water, which falls in a succession of cascades into the pools.